Even the look of a Scottish lass off the moors can be easily done with the right attire. This Ladies Highland Dress is just right for those girls who want to recreate the iconic look of a bonnie lass right out of Highlands! This highland lassie dress is designed so that the sleeves, bodice, and skirt are all made into one, eliminating the need for three garments! Not only does this help to reduce costs, but it also helps to keep you cool, by reducing the layers you may have to wear in warmer seasons! The dress features a square neckline with a black bodice, adorned with white lace trim around the neckline and hem, as well as full-length white sleeves to match. 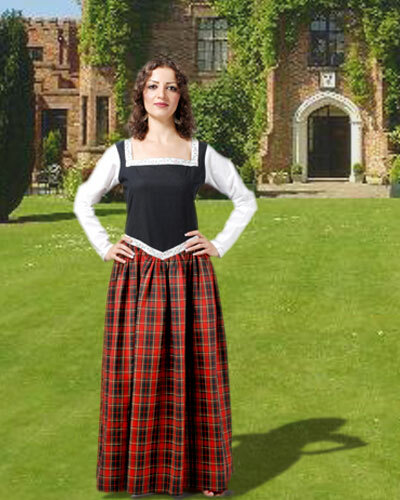 The full length skirt drapes down to the ankles, while also featuring a classic red and green tartan pattern. The dress also features lacing on the back to help with adjustment and with wearing. It is available in only one color, but it does come in four different sizes. If it is the Scottish Highlands for you, lassie, then you had best be attired properly. The Ladies Highland Dress is a classic way to not only show off your love of the style, but also a great way to celebrate a little culture, and maybe some heritage, in your historical outfit, too!